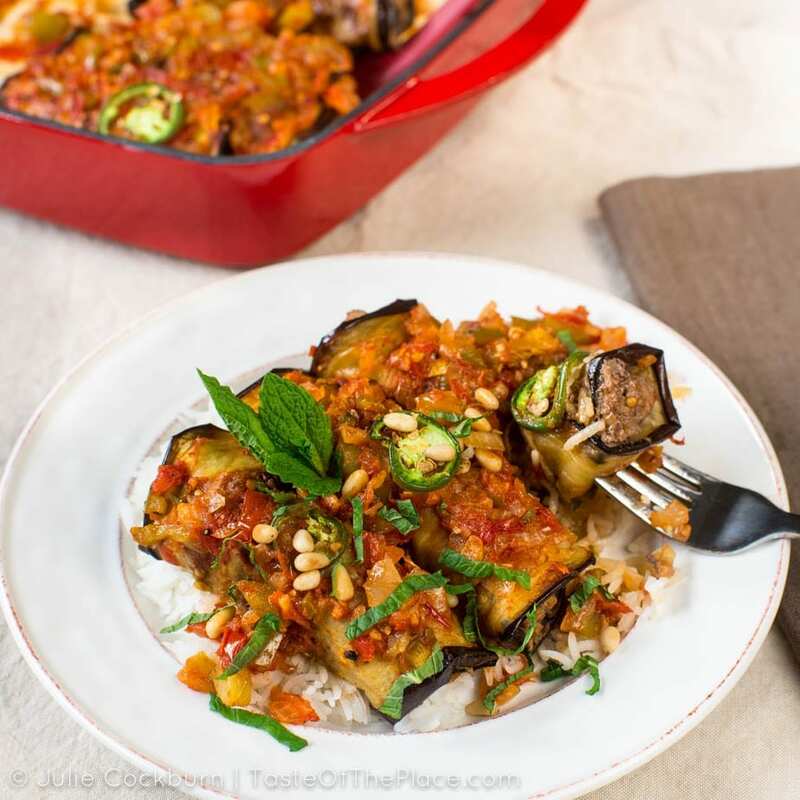 Perfectly seasoned beef, rolled in roasted eggplant, drizzled with a savory and spicy tomato sauce, and topped with crunchy pine nuts and aromatic mint leaves, make this Jordanian recipe for Royal Kebabs a true crowd pleaser! We are back to the Middle East this week in our culinary explorations. 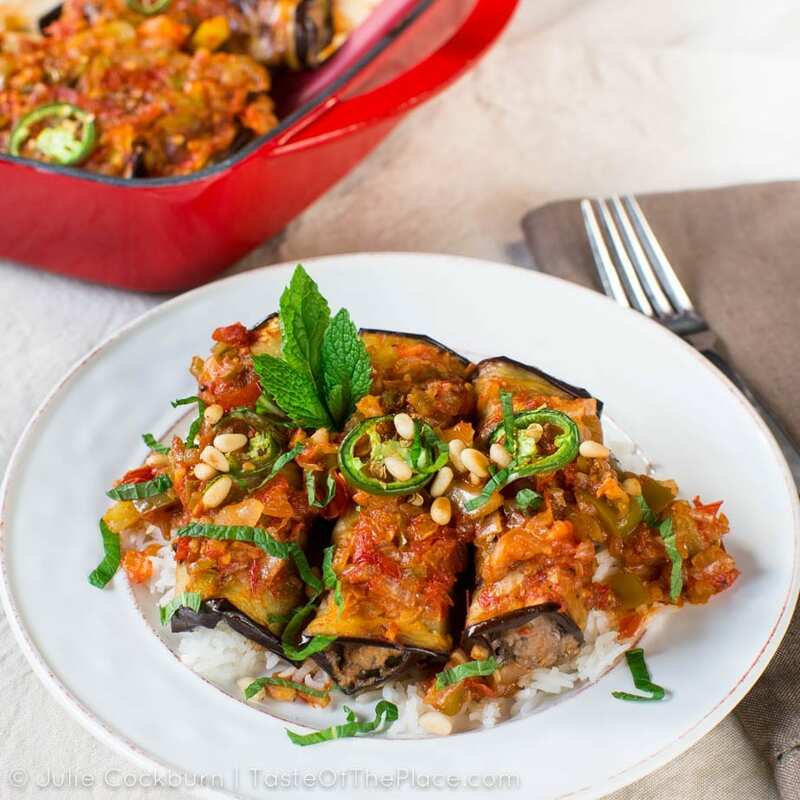 This particular recipe comes to us from Jordan, and is one of my favorites! I guess I have a lot of favorites 😉 , but I’m always especially drawn to savory beef and veggie combinations – no matter where they come from in the world. 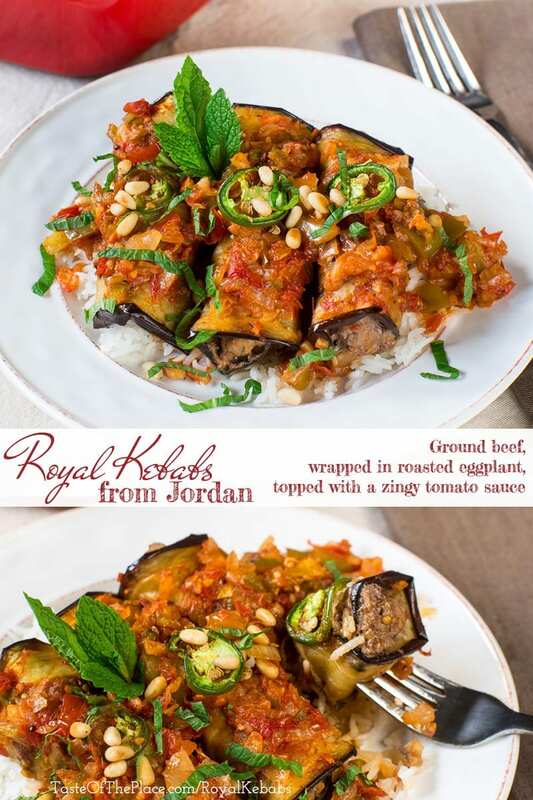 And this one is extra tasty – it’s called Royal Kebabs, and is a delicious dish of perfectly seasoned beef, rolled in roasted eggplant, drizzled with a savory and spicy tomato sauce, and topped with crunchy pine nuts and aromatic mint leaves. Divine! As you may know, the Taste Of The Place cookbook is just weeks away from publication, and this is one of the many delicious recipes. 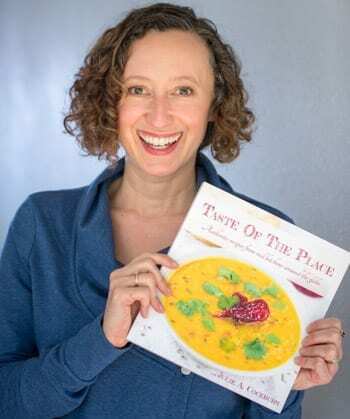 It comes from the chapter all about Jordanian food, and was contributed by my friend Mira Jarrar, who is a chef, food educator, and food blogger from Amman, Jordan. “Jordan is a small country in the Middle East with a population of about 6 million. I love the air and the land here. I have many cherished memories in this part of the world, especially from my childhood. Amman was where we spent our summer vacations, and what fun we had! The beautiful weather, the caring and loving family atmosphere, and the invitations to dinners prepared with fresh and flavorful ingredients that had been fed by the sun and soil of Jordan – all combined to make my summers wonderful and memorable. “Food in our part of the world is healthy, fresh and delicious, and brings people together several times a day. I come from a family that has long appreciated and enjoyed the pleasures of cooking, sitting around the table and sharing a meal with family and friends. As you can imagine, growing up in my family instilled in me not only a love of cooking, but of sharing, learning and preparing food for others. I was always by my mother’s side to learn everything she could teach me. “I cooked this dish as a thank you gift for a friend. While it was baking, my next door neighbor knocked on my door, and told me that her guests were urging her to ask me what I was cooking because it smelled amazing! Of course I sent them a plate to taste. Outside of the U.S., the word Kebab or Kabob refers to more than just chunks of meat roasted on a stick. 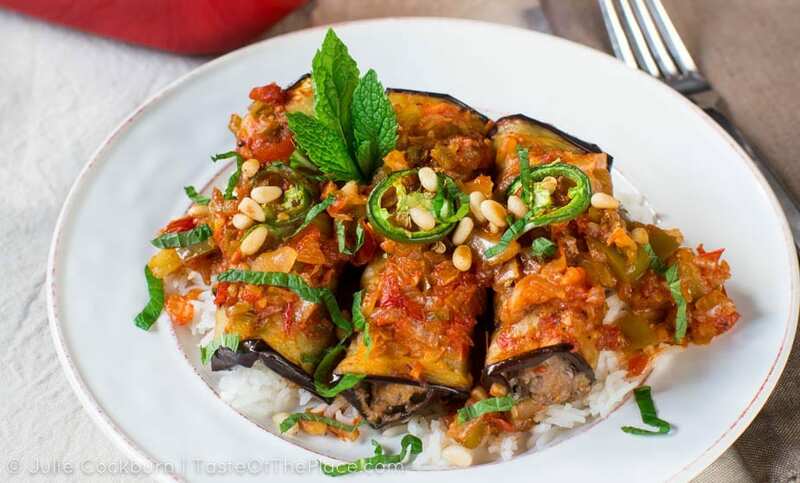 In this case, ground beef is rolled into logs, wrapped in succulent eggplant, and baked with a zesty sauce. This recipe is perfect for a weekend gathering. It can be put together ahead of time and baked right before serving, or baked ahead of time and reheated just before serving. Serve the kebabs on their own, or alongside rice and a green salad. They make a satisfying entree, or can be enjoyed as an appetizer. While not traditional, and perhaps a bit cross-cultural, I think the royal kebabs would be delicious served with a drizzle of zhoug (a fiery Yemenite condiment) or alongside a plate of shakshuka (a savory combination of eggs and tomatoes enjoyed throughout the Middle East, but especially in Israel). Brush the eggplant slices with olive oil on both sides, then lay them in a single layer on one or two parchment paper lined baking trays. Bake, flipping once during cooking, until they are golden, about 20 to 30 minutes. Remove from the oven, allow to cool to the touch. Meanwhile, in a food processor, pulse the onion with the bell pepper until smooth. Add the bread crumbs, ¾ teaspoon of the salt, and ½ teaspoon of the black pepper, and pulse briefly to combine. Transfer to a large bowl, and combine with the ground beef, remaining ¾ teaspoon salt, and ½ teaspoon black pepper. Mix well. Shape the beef mixture into logs (these are kebabs) about 4 inches long, and 1 inch thick. Try to end up with the same amount of kebabs, as baked eggplant slices. Heat the olive oil in a wide skillet over medium heat until shimmering. Add the onion, and cook until the soft and translucent. Stir in the green bell pepper, the diced chilies, and tomato paste. Continue cooking, stirring constantly, for 2 minutes to bring out the flavors. Stir in the diced tomatoes, salt, and sugar. Bring to a boil, then reduce the heat to medium low, and simmer for 15 minutes. Stir in the cinnamon, and remove from the heat. Putting it together - this is the fun part, and great for kids! Pour half the sauce in the bottom of an 8x8, or similarly sized, baking dish. Lay an eggplant slice out on a work surface, place a kebab at one end, and roll. Repeat with all the eggplant slices. Arrange the rolled up kebabs in a single layer in the prepared dish, and pour the other half of the sauce over top. Sprinkle the sliced chilies on top, and bake for 35 to 40 minutes, or until the meat is cooked through and reaches an internal temperature of 155°F. Sprinkle some pine nuts and mint leaves on top for garnish. You can enjoy this royal dish with white basmati rice, or use your hand (contrary to royal etiquette! ), and pick it up with folded pieces of pita bread, like my father prefers. I am a Jordanian with roots in Palestine. I come from a family that has long appreciated and enjoyed the pleasures of cooking, sitting around the table and sharing a meal with family and friends. I live with my husband and three boys. 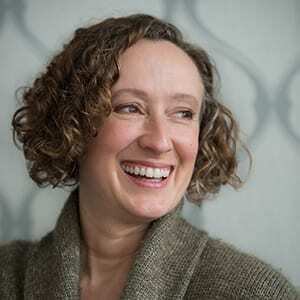 I am a Jamie Oliver Food Revolution Super Ambassador, and my small business, Mira’s Young Chefs, teaches kids how to prepare delicious, healthy food that they will enjoy eating.